To be completely up front I wasn’t really in a rush to try out the new Supertrac Ultra RC shoe, not because I didn’t like them or want to see what everyone seemed to be shouting about, but mainly because up until this point I have been so smitten with the original Supertrac RCs (I will abbreviate to STRC to help differentiate in the review) to since getting my hands on a pair in November 2016 (Original video review here). 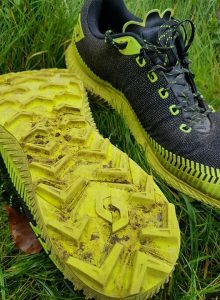 Since then I have used them for every day road and trail training, from 5k park runs to mountain ultra races such as the Transvulcania and also the Lakeland 100. 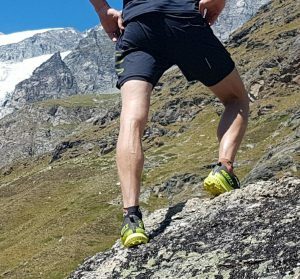 They are a very versatile shoe and which have been lasting well and feel great on a wide variety of terrain. So where on earth does this leave the Ultra version? Maybe worth explaining the difference between the two a little bit, the original STRC shoe was primarily designed as a high performance race shoe, lightweight and relatively low drop, (5mm) robust and close fitting, (for my feet anyway) awesome grip on a wide mix of surfaces and also when being dragged down hills by our very excitable dog. It is a great race shoe and really lets you get your teeth into the trail. As an all day fit and forget shoe it doesn’t quite offer as much protection and comfort as the ever faithful Kinabalu Supertracs I also have, these are so comfy and solid I could wear them all day and not have any foot soreness or discomfort. 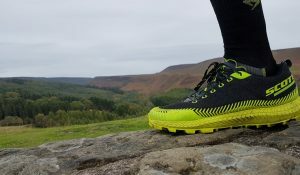 As much as the Kinabalu is such a comfy shoe, there is a bit of a weight penalty especially when wet – again a great training shoe but not quite high performance. So along comes the Supertrac RC Ultra, with a very similar design and tread pattern as the STRC but extra high and cushioned, plus using some very high tech material on the uppers. It seems to tick the boxes needed for some longer days in rough terrain yet also keeps the weight down especially when wet. But don’t be fooled, Scott haven’t just added some foam and thrown the shoe out there, there has been some serious work and development put into this shoe. With a 7mm deep lug they offer plenty of grip and also use a rather cool looking diamond pattern in the sole bed to help shed mud and sheep poo. The lugs are also specifically laid out to offer good stability on hard ground as well as in the soft and loose dirt or mud. The uppers use a special Schoeller Dynamic fabric, which is basically water resistant, breathable and hard wearing, then supported with a solid ring around the whole foot for extra protection. Plenty of testing and development work went into these between athletes and designers with comfort being one of the key factors. So how do they actually feel when you get them going? 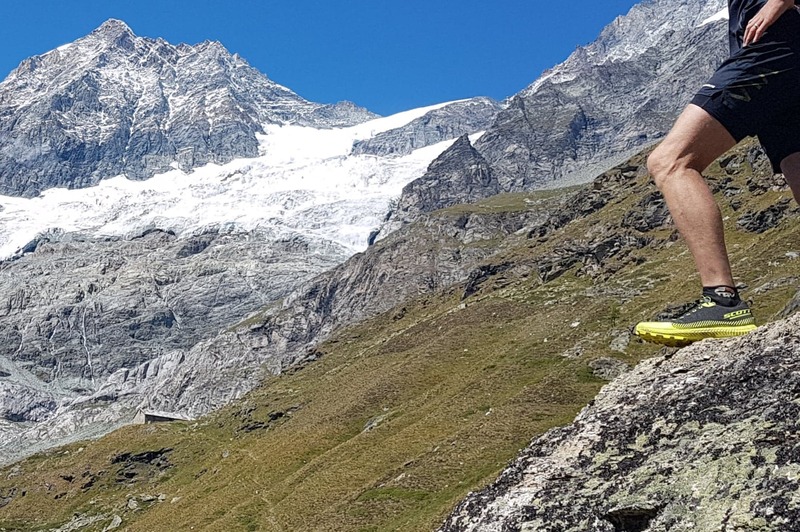 We were lucky enough to have some time in the Alps over the summer so I managed to get plenty of time in them out there, as well as back in the UK on the moors and trails so have had a good variety of terrain to put them through their paces. The only thing I have not yet done is give them a really good pasting in very very wet boggy conditions (by this I mean ankle deep stuff) to see how they drain and feel after a long day out with completely saturated feet. I will undoubtedly be doing plenty of this in the coming months so will update as this goes. Out on test once I had pried off my STRCs, I was pleasantly surprised how comfy the Ultra was, that being said I would say they are a slightly smaller size than the STRC so would go 1/2 size up next time, or even a whole size up in winter if I want to wear a thicker sock. However, after a couple of runs they seemed to ease off a little and I got the lacing about how I wanted it. The extra cushioning was certainly apparent and I found that being out for a few hours in rocky rough Alpine terrain left my feet feeling pretty good. The extra heel to toe drop was a bit noticeable at first (these are 8mm) and I am fairly well attuned to any changes in this so it did take a little getting used to. A few long days out and I started to get into the shoe more. The feel is obviously going to be different to a lower drop less cushioned shoe, not so much in a unstable way to be honest but almost like I could be a little more careless about where I was putting my feet and get away with it. The Ultras seemed to take everything in their stride a bit more and I could plough across and through things I may have previously been a little more conscious about. A bit like putting a fatter tyre or suspension on your bike, you just get away with things a bit more. Obviously there is a bit of a trade of for this with a little less active feedback and them not quite being as responsive. Grip wise they are very solid and dig into everything I have thrown at them so far. Obviously not a mud specific shoe but certainly hold their own on wet slippy surfaces but equally transition well into rocks, hard packed trail and even tarmac if you are unlucky enough to end up on the stuff. Overall for me personally they absolutely have a place in my running; the solid grip and sturdy construction means they should keep on giving for a while yet and having done a good 20-30 hours or so in them so far they barely look used or worn anywhere so I expect them to last a while longer yet. I think if I was doing the LL100 or any other race over 30-40 miles I would go for these for sure as well as long training runs just to reduce some of the impact and pounding for my feet and body. If you are looking for an all day fit and forget shoe that will last you a while but do not weigh a ton, yet still have enough grip to keep you out of trouble then these are well worth a look.